Not all diets are created equal... and not all plans work for every person. Which is why my team and I have developed a completely free guide to help you pick the perfect plan for you. In this guide, I break down what I call The Triple Punch Method to add magic to your weight loss goals, provide you with a list of yes and no foods to avoid inflammation, and teach you how to maintain your weight once you've reached your goal, without missing out on your favorite foods. You’ll discover three plans that will put you on the path towards a healthier life, and make you feel like yourself again. The 10-Day Belly Slimdown, Bone Broth Diet, and Total Health Reboot are all designed to make your transformation a breeze. Simply enter your name and email address to get this free guide delivered to your inbox. In the guide, I'll break down my three pillars for healthy weight loss; fasting, bone broth and collagen, and fat-burning foods and I'll teach you how to use this Triple Punch Method for optimal results. I've also provided a few easy, go-to recipes to assist you along your journey. I've helped thousands of people lose weight take advantage of the benefits of bone broth, collagen and fasting. And when you develop these same healthy habits, you too will experience the amazing health benefits and jaw-dropping results. Why Bone Broth & Collagen? Bone broth does amazing things for your body! When you drink it regularly, you load your cells with: gut-healing glycine, joint-protecting glucosamine and chondroitin, and inflammation-fighting properties that help you lose weight. Bone broth is also packed with collagen which helps to rejuvenate skin, burn fat, and form lean muscle mass, shaping your arms, legs, and core. The amino acids found in bone broth aid your liver in removing toxins form your body making it the ultimate detox. This helps to heal your gut, curing digestive problems and facilitating weight loss. Bone broth is also hydrophilic which means it attracts and holds liquids, helping you digest food more efficiently. This will substantially decrease the effects of bloating. 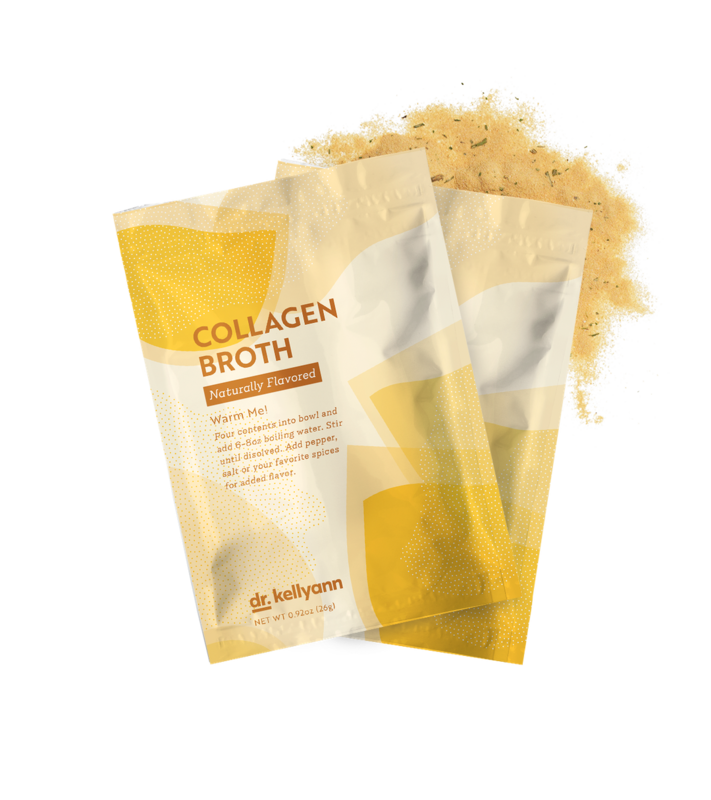 Collagen Broth to go allows you to load your body with essential nutrients that fight inflammation and help you lose weight. Collagen is a strong protein naturally produced by your body. It’s synthesized mainly from two amino acids (the smallest units of protein)–glycine and proline. And it’s the major component of connective tissue as well as your hair, skin, and nails. In fact, collagen makes up approximately 33% of the total protein in your body, and it accounts for roughly 75% of the dry weight of your skin. Needless to say, collagen is an essential protein thats vital to your health as well as your appearance. That's why collagen plays such an important role in my delicious collagen product line. It's truly the hidden gem in our bodies. And because the collagen in my products is sourced from grass-fed beef... it's simply the purest, best choice for your collagen supplement. It also supports muscles, joints, tendons, and ligaments. From the age of 20 on, you lose about one percent of your collagen each year. This leads to wrinkling, sagging, cellulite, and achy joints. To prevent this relentless aging, you need to increase your collagen levels. We've made getting your daily dose of collagen simple, easy and delicious with on-the-go packets. All you have to do is add water. 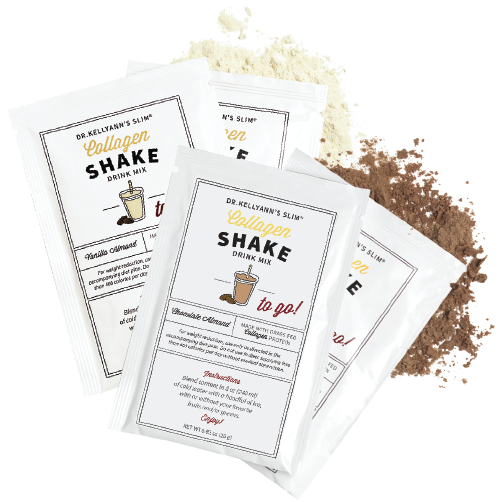 My broth, and shakes are loaded with the building blocks of collagen and streamlines these benefits directly to your cells. Typically fasting is hard for many people, but mini-fasts, where you replace meals with cups of bone broth, gives you the benefits of fasting without the hunger and cravings that make regular fasting so difficult. Mini-fasting is not a traditional diet. It’s a sustainable lifestyle change that is flexible and can be adjusted to you. Get the tools you need to make 2019 your healthiest year yet! Creating real change in your life can be difficult when you don’t have the right tools on your side. Downloading the Perfect Plan guide is the first step down the road to the change you want. To make your journey even smoother, I've bundled these easy-to-use products to support you through the plan you choose by giving you delicious food that will help you along the way. All of my products are loaded with nutrients like grass-fed protein, that helps you feel full and satisfied, and high-quality collagen that helps you reduce inflammation, repair joints, and promote healthier hair, skin, and nails, and have you feeling and looking better than ever.